The main event site for 2013 is the stretch of Rainier Ave S between S 51st St and Seward Park Ave S. Additional sites will include the business district around Rainier Ave S & Rose St and S 57th St. The event will feature visual artist exhibits inside participating business venues and art and food vendor booths outside in the parking lots of other participating businesses and properties. The event will also feature temporary art installations, site-specific art and performances, a walking tour of Rainier Beach, entertainment, and booth space for various non-profits and community associations that provide services and activities for the residents and visitors to Southeast Seattle. Applications are being accepted for Indoor Venue Exhibits, Hands-on Artist Projects, Artist Demonstrations and Artist Vendor Booths. Business Venue Artists exhibit their 2-dimensional work within a place of business for a period of time mutually agreed upon by the business/property owner and artist. Artwork is not required to be for sale. Available venues are limited. Space available for exhibits varies from venue to venue. Artist Vendors offer quality, original handmade items and artwork for sale. There is a booth fee to participate. Fees support the art walk. Hands-on art activities offer a quality, hands-on art-making activity. Activities ideally should take no more than 15-minutes to complete and should be carried away by the person who created it when completed. All hands-on activities must have someone present in the booth at all times providing instruction and supervision of activities. Hands-on activity artists may also set up as a vendor to sell their own completed artworks. The booth fee is waived for those providing an activity. A small stipend is available for art-making supplies. 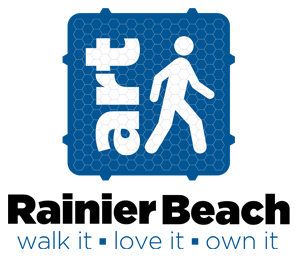 Art Walk Rainier Beach Committee is looking for a diverse representation of art and arts-n-craft disciplines working in all sorts of mediums. Business Venue Artists are required to hang their artwork and will be responsible for all set-up/take down based on mutually agreed upon arrangements and terms with the host merchant. The Art Walk Committee or RBMA will not assume any responsibility or liability. There is no fee for Merchant Venue Artist exhibits. All participants are required to provide their own set-up, supplies and materials, including but not limited to canopies, tables, tents, chairs, supplies, tools and/or equipment to install work, all art-making materials, inventory, booth signage, personnel, etc. Water and power are not available for outdoor booths. There are approximately 20-30, 10x10 outdoor booth sites available. The booth fee is $30 (A limited number of double booths are available. $45 for a double space). Artwork exhibited during the festival must be consistent with images and descriptions provided in the application (see application below for details). If you provide a hands-on activity or demonstration throughout the event, your booth fee will be waived. The spirit of the art walk is to highlight original work (regardless of other artists' influence) and individually fabricated, handmade art work, jewelry, arts-n-craft items, clothing, etc, by the artist/crafts person who applied to participate. An associate of the artist may sell/exhibit the artists’ work if the artist cannot be present. An artist may include another artist’s work if that artist cannot be present at the event. Another artist's work needs to be included with the application. An artist may not sell or exhibit artwork that is mass-produced or manufactured (prints of artist’s original work is permitted). Artists are selected by the Art Walk committee. On the day of the event, all vendors must be ready to go at 11:00 am and remain selling and conducting activities through 3:00 pm. No exceptions. If your plans change and are unable to remain throughout the entire event, please contact the art walk coordinators no less than 24 hours in advance to cancel your participation. Participating artists are required to operate their booth in a safe and tasteful manner, to comply with the laws of Washington State, King County, and the City of Seattle, and to obtain any and all permits and sales tax necessary from the state, county and city. Complete the attached application form on the final page. Return it with the required application support materials to the address or email listed below. Three (3) PC-formatted JPEG digital images of 3 different, completed artworks that are representative of all your work. Images should have a maximum width of 800 pixels. Images can be on disk, thumb drive or via email. Please, no PowerPoint files. A corresponding annotated image list that includes a description, materials used and sale price (“NFS” for Venue Exhibits, if not for sale). Provide two to five (2-5) PC-formatted JPEG digital images with a dimension of maximum of 800 pixels wide of proposed hands-on project or demonstration. Process or final product images OK. Images can be on disk, thumb drive or via email. Please, no PowerPoint files. On the application form in the space provided, include a project title and description of art-making project or art demonstration, including materials that will be used.